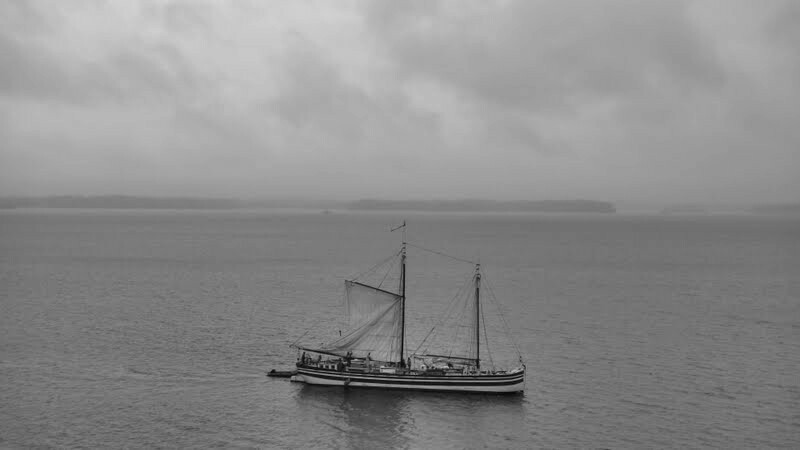 Leaving Whitehall, we headed for Port Henry with the anticipation of re-rigging the Lois for her final few ports on the lake. The southern lake is a beautiful place to travel through, more river than lake, and we were graced with great weather to enjoy it in. Wildlife was everywhere – heron, osprey, even a few eagles! Cameras were clicking left and right as we all took in the sights. 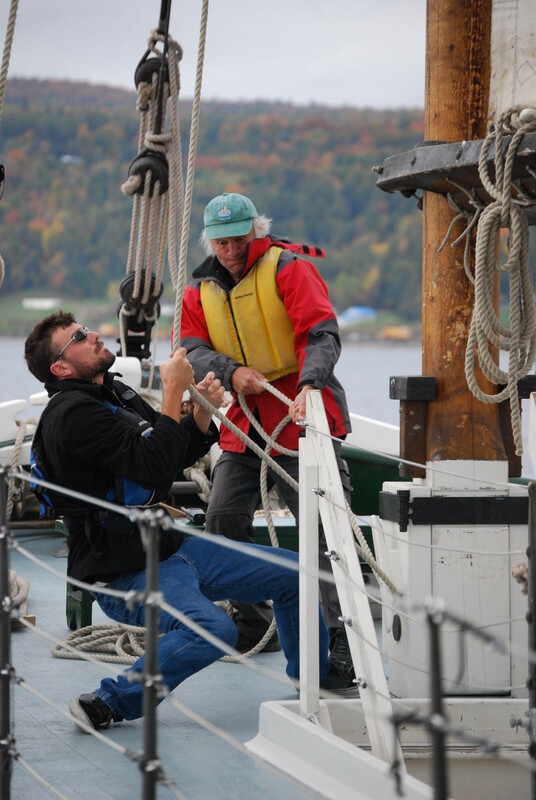 By now, on our 9th rigging operation of the season, we were getting pretty smooth at it. 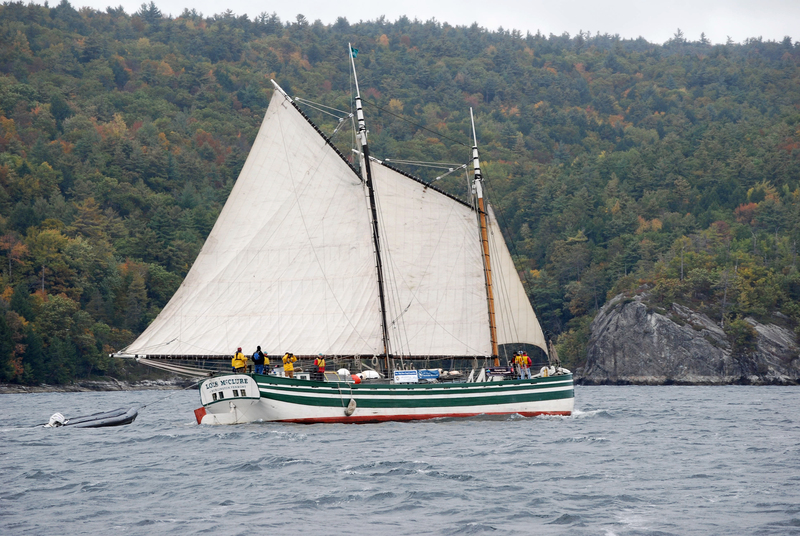 Brown’s Crane Service of Bristol, Vermont, came to provide the heavy lifting help, and in no time at all, the Lois was looking like a sailboat again. In celebration, Co-Director Erick Tichonuk had the crew over to his house for dinner, providing a veritable feast, while Ian Montgomery and Doug Riley entertained the crew with music. The next morning, we all had our fingers crossed – opportunities to actually sail the Lois are few and far between. As is often said to the public “Sailing and schedules don’t mix well.” Thankfully, on our last day that we would be able to sail, the winds cooperated. While it started out slow, the wind kept building, until we were rolling right along. The sound of the boat under sail is so different than our usual method of movement. No engine noise, no smell of diesel, no vibration from the tug next to us. It is very serene. The wind kept building through the day, slowly picking up until we were really moving along. Sailing the Lois is often an exercise in patience, as we usually get “sailable” days that are fairly mild in terms of weather. This one started that way, and after a few hours decided to give us a bit of excitement. Shortly after we sailed passed North Harbor (waving to LCMM’s campus, the Philidelphia, and the staff on the dock), the rain joined us as the wind kept rising. Coming up to Essex with the wind behind us, Roger took us over to the lee of Gardner Island so we could gybe over with as little drama as possible. Gybing can be a tense moment as there is no gradual fill of the sails as with tacking – the booms can come whipping across the deck, the sails fill with a bang, and the boat really moves. Gybing in a lee makes it much more controlled. Even so, on this sail once the sails were shifted over, the Lois heeled over a bit, and took off like a locomotive. It’s rare that we are given a chance to really let the boat stretch her legs a bit, and experiences like this one are truly exciting. All too quickly, we were coming up on Essex, and had to dowse sail and bring the tug alongside. It was a major treat to be able to have such a sail on the last possible day for it.